Jean was born on October 20, 1920, in Cleveland, Ohio, the second of three children to Inez Elizabeth (Wood) Fairfax and Dan Robert Fairfax. Her parents and her beloved siblings, Betty and Dan, Jr., predeceased her. Jean dedicated her entire life to advocating for equal opportunity for all. Wherever she lived, Jean Fairfax championed education to elevate people, and she was a key motivator of meaningful change. The daughter of two college graduates, Jean excelled in higher education, graduating with Honors in Liberal Arts from the University of Michigan and being inducted into the honorary fraternity Phi Beta Kappa. She went on to earn a master’s degree in World Religions from Union Theological Seminary in New York City. Jean began her career as Dean of Women at Kentucky State College and later served in the same post at Tuskegee Institute. 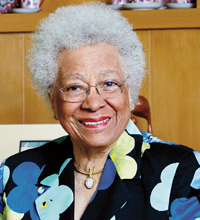 She committed much of her time and talents to the American Friends Service Committee working as a direct relief worker in Austria following World War II, a director of college programs and as an administrator of Southern Civil Rights programs. She was a leader among citizens who rallied behind the cause of free- and reduced-lunch programs following publication of the 1968 study, “The Daily Bread,” and she was instrumental in the desegregation of higher education. Jean’s sister Betty moved to Arizona in the 1950s and worked as a teacher and counselor with the Phoenix Union High School District for over 50 years. Because of her dedication to education, a high school in Laveen bears Betty’s name. When Jean joined Betty in Arizona in the 1980s, they pulled their modest financial resources and actively engaged in a vast array of civic-minded philanthropic pursuits. Through the Arizona Community Foundation, the Arizona State University Foundation, the University of Michigan Foundation, the Cleveland Foundation the Southern Education Foundation, Jean and Betty supported many educational and scholarship programs, as well as nonprofit organizations addressing community needs, including social equity in education, housing, health care, employment, and criminal justice. Jean and Betty also expressed a passion for the arts in their philanthropy. At ACF, they created the Betty H. & Jean E. Fairfax Fund for Educational Equity, and Jean went on to found the Black Legacy Endowed Fund, where she served as trustee. Jean believed that anyone and everyone can be a philanthropist and that through “giving,” ordinary people can bring about transformational change in our world. Her ongoing efforts to encourage others to invest in their communities inspired Arizona’s leaders to form the Black Philanthropy Initiative. Jean served on many boards of organizations, including the World Council of Churches, Urban Institute, National Public Radio, Planning Committee of the White House Council on School Lunch Participation, National Commission on Secondary Schooling for Hispanics, Children’s Foundation, and Women and Foundations Corporate Philanthropy. She also won numerous awards, including the Radcliffe College Lifetime Achievement Award, Council of Foundations Distinguished Grantmaker of the Year Award, First National Conference of Black Philanthropy Lifetime Achievement Award, Kent State University President’s Social Responsibility Award (with her sister Betty), Arizona State University Martin Luther King, Jr. Servant-Leader Award, Hon Kachina-12 Who Care Award, and the Maricopa County YWCA Tribute to Leadership Award. Upon Jean's passing, the Betty H. & Jean E. Fairfax Fund for Educational Equity was renamed the Jean E. and Betty H. Fairfax Memorial Fund, with a focus on civil rights, arts, education, and environmental justice.